Do you ever have those instant cravings, no matter where or when, you just NEED chocolate immediately? I have them fairly often. My sisters and I share that same need. We love our chocolate, especially molten chocolate cakes. One of our favorite steak houses has an amazing Valrhona molten chocolate cake. We always order our own because sharing chocolate is not an option when you have this need. One night a few months back I was in need of a quick chocolate fix. I didn't have my mom's recipe or the time to call her and get it and all the ingredients. I hit the internet and started my search for a quick fix. I stumbled upon this fabulous recipe. With a few tweaks, I perfected it into my delicious, QUICK chocolate molten cakes. In less than 15 minutes, your chocolate fix can be ready for the oven too. This gooey chocolate cake looks very modest. It comes out hot from the oven looking like it might even be a little overdone or dry. 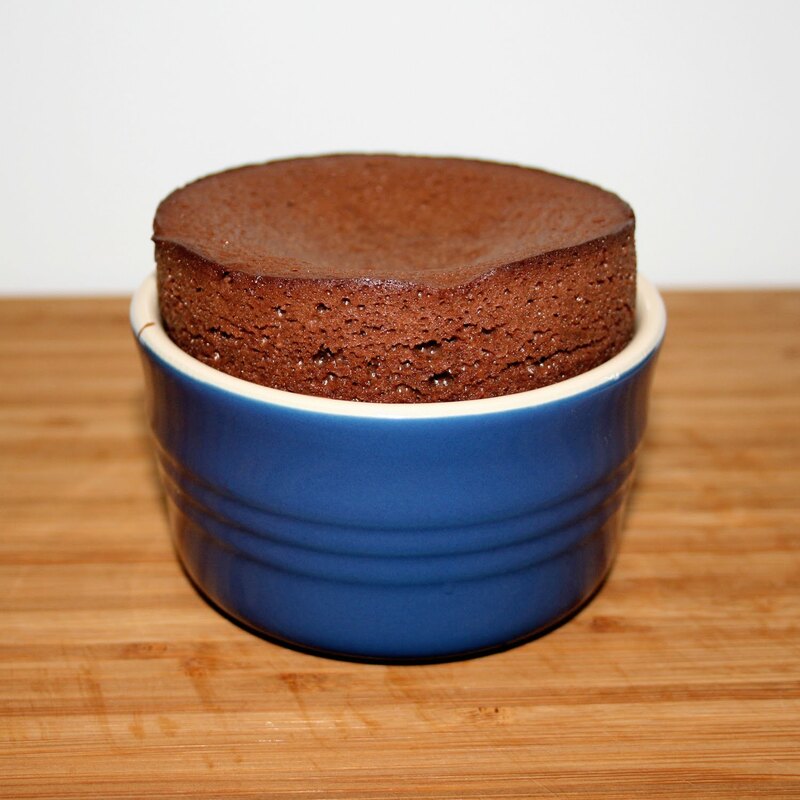 Don't be fooled by this cake - it will ooze and gooze and deliver on your NEED of chocolate. I recommend using the best quality chocolate you can find. Don't bother with that Hershey stuff, go for the real deal (unless that's what you love, then by all means Hershey-away)! I usually make it with Ghiradelli 60% dark chocolate but if you can get your hands on Valrhona, Guittard, Domori, or Berger - they are fantastic brands for chocolate purists and enthusiasts! This recipe would be perfect to make for Valentines Day. If you don't have a Valentine, this cake is perfect treat to celebrate being single. It's chocolate, there's a million reasons to make this molten cake! Preheat oven to 350º. Grease 4 ramekins and place on a cookie sheet, set aside. 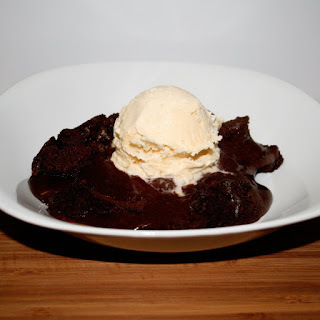 In a double boiler (glass bowl inside a sauce pan with boiling water) place chocolate chunks. Meanwhile, mix eggs and sugar together with a hand mixer until it thickens and turns a light yellow color. Check back on your melting chocolate. Keep a close eye on it, you wouldn't want to waste all that good chocolate by scorching it! When chocolate is completely melted, add butter cubes. Stir until butter is melted and the chocolate has a nice glossy sheen. It's like these two were made for each other! Finally add vanilla. Slowly add warm chocolate mixture to egg and sugar mixture. I turn the egg beaters on and slowly drizzle the chocolate in so that the eggs don't scramble. You could also temper the batter by adding a small amount of the chocolate first and then add the remaining batter. Finally add the flower and you are all set for ramekinville! Pour batter equally into the 4 buttered ramekins. Place in the oven for 15 minutes. DON'T PEEK, you'll cause your cakes to deflate before they become cakey-goodness! If you like your cakes really gooey, like me, pull them out now. If you like them a little more cake like and less gooey, leave them in for another 3-5 minutes. Skim a butter knife around the outside of the ramekin, flip upside down, and place in shallow bowl or dish. Top with a big scoop of vanilla ice cream and brace yourself for chocolate heaven! It's not as pretty when you see it all oozy, but I have to share it with you because no matter how ugly it photographs, it is INSANELY delicious! Try substituting the vanilla extract for raspberry or almond extract or even orange liquor. You can add 1 t. cinnamon or espresso powder to add flavor too. Serve it with raspberry sauce, bourbon caramel, or a creme anglaise in addition to or instead of the ice cream. Not a huge dark chocolate fan? Make it with milk or semi sweet. Morgan This looks delicious! I can't believe you made this without me! I hope it was AMAZING! Mo, the new pictures that you uploaded on the top of the desserts don't show up, but the chocolate ones do! thanks lex. should be all fixed now! I can. not. wait. to make this next week! 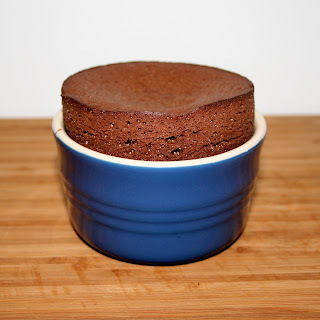 I haven't made it but I was looking for a recipe for just one mug cake so anyway I might be making it soon but I have to purchase some ramekins so I can make several at one time ! !